The Dave Smith Instruments Prophet Soft Case is designed for the storage and transport of your Prophet 12, or, using the included width spacer, Prophet '08 synthesizer keyboard. It has a plush interior with an ABS plastic reinforced hybrid shell and water-resistant Sharkskin outer shell. Its handles and shoulder straps are steel rivet reinforced and the shoulder strap has an adjustable chest clip. The case has an external storage compartment for pedals and cables while its interior mesh pocket can hold smaller items. Dual anti-skip zippers are used to close the case. Box Dimensions (LxWxH) 41.0 x 15.0 x 5.0"
is this case fit for DSI prophet 6? 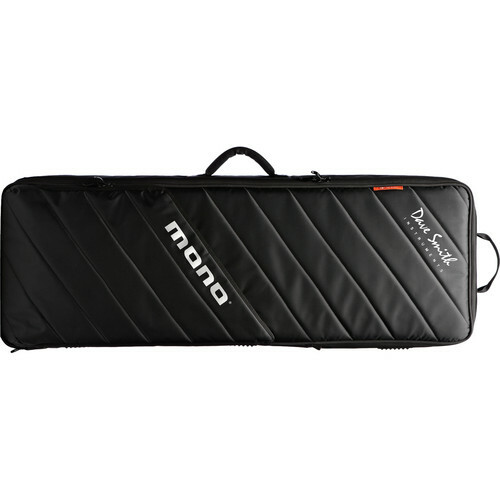 The Propet soft case is designed for the Propet 12 and can accommodate the Prophet 08 as well with the included width spacer. According to the manufacturer these are the units compatible. The Prophet 6 is slightly smaller in width than the 08, and may fit the case as well, but we would not be able to confirm.